Last update issued on October 1, 2003 at 03:10 UTC. The geomagnetic field was quiet to unsettled on September 30. Solar wind speed ranged between 275 and 364 km/sec. The interplanetary magnetic field was weakly to moderately southwards most of the day, however, this didn't cause a noticeable increase in geomagnetic disturbance levels. Solar flux measured at 20h UTC on 2.8 GHz was 133.0. The planetary A index was 7 (STAR Ap - based on the mean of three hour interval ap indices: 8.6). Three hour interval K indices: 22233222 (planetary), 11221112 (Boulder). At midnight there were 7 spotted regions on the visible disk. Solar flare activity was low. A total of 11 C class events was recorded during the day. Region 10464 decayed further but still has some polarity intermixing in the trailing spot section. Flares: C1.7 at 00:32, C2.4 at 01:10, C1.6 at 03:02, C5.1 at 03:40, C3.3 at 05:12, C2.8 at 08:01, C3.2 at 08:52, C3.0 at 12:50 and C3.9 at 23:26 UTC. Region 10466 decayed slowly and quietly. Region 10469 developed slowly and was quiet. Region 10470 was mostly unchanged and quiet. New region 10471 rotated fully into view at the southeast limb. It is still not obvious whether or not the leading penumbra (which rotated into view as early as late on September 28) should be classified as a region by itself. 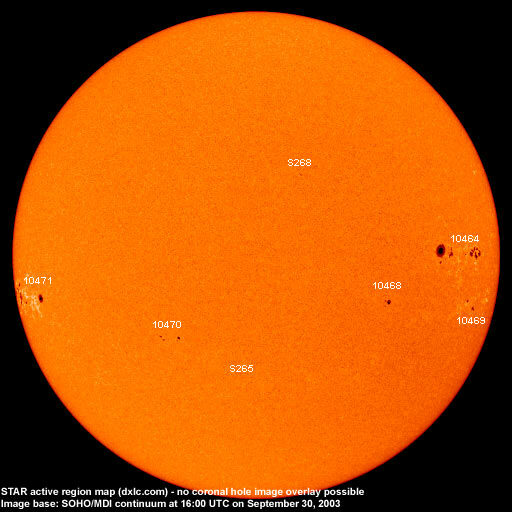 Currently the region has spots spread out over more than 20 degrees longitude. The region has a complex trailing spot section with several small areas of negative polarity inside the strong positive polarity area. Minor M class flaring is likely. The plage between the leading penumbra and the trailing spot section is fairly hot. 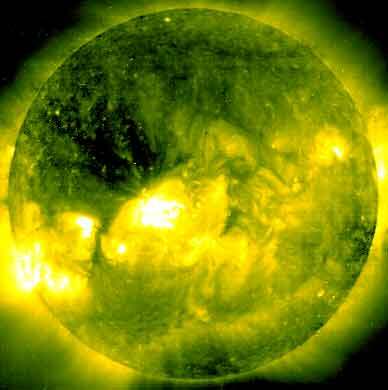 Flare: C4.9 at 20:21 UTC. [S265] A new region emerged in the southeast quadrant on September 29. Location at midnight: S23E04. [S268] This region emerged in the northwest quadrant on September 30. Location at midnight: N25W12. September 29-30: No potentially geoeffective CMEs observed. September 28: CMEs were observed mainly off the north and south poles. A fainter extension over the east limb indicates that one of the CMEs may have been a partial halo CME. With no EIT images available it is difficult to determine if the CMEs had frontside or backside sources. No obvious coronal holes are currently approaching geoeffective positions. Processed SOHO/EIT 284 image at 19:06 UTC on September 25. The darkest areas on the solar disk are likely coronal holes. The geomagnetic field is expected to be mostly quiet to unsettled October 1-6, isolated active intervals are possible on October 1. Long distance low frequency (below 2 MHz) propagation along east-west paths over high and upper middle latitudes is poor to fair and improving. Propagation along north-south paths is fair. [Trans Atlantic propagation conditions are currently monitored every night on 1470 kHz. Dominant station tonight: Radio Cristal del Uruguay early on, several station from the northern part of South America observed later. On other frequencies several stations from the Canadian and US east coast were noted].